Single-Ply membranes are the most difficult roofing membrane to adhere to due to how they physically break down and the residue that remains. 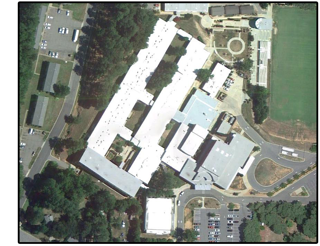 Most roof coatings require caustic primers, acid etching agents, or high VOC solvents that need to be rinsed off and sometimes collected for disposal, adding additional cost to a roof life extension project. National Coatings fortunately has a quick and easy solution for Single-Ply --- the AcryShield A502 base coat. A502 allows for direct and tenacious adhesion to Single-Ply membranes without the need for a primer or etching rinse. A502 was introduced by National Coatings Corporation in 2006 after three years of intensive research and successful installation, including both laboratory and actual in-service field testing. This coating was designed with self-priming characteristics that eliminate the need for additional primers or etching rinses while exhibiting a tenacious adhesion for thermoplastic and thermoset single-ply membranes, such as Hypalon, TPO and EPDM. Previously, the only primers used for coating these membranes were solvent borne, which required warning labels, had very high VOC (volatile organic content) and required extreme care when applying to prevent fumes from entering the building. The only other option for coating EPDM was a "prewash" or "rinseable primer" that had a very high, corrosive pH, so high that it would react with human skin oils, causing chemical burns. It is water borne, so there is no concern about flammable solvents, VOC or fumes entering buildings. It replaces both specialty primers for the thermoplastic membranes and the corrosive rinseable primer for EPDM. Thus there is no need for separate primer/basecoats for different types of roofing membranes. 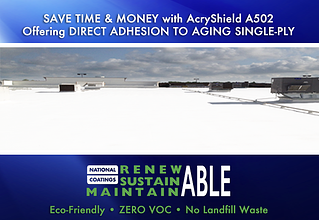 AcryShield A502 has allowed National Coatings to be the only roof coating manufacturer with industry leading capabilities that successfully adhere directly to aged and failing single-ply membranes with a proven and verifiable 10-year track record. The next time a project calls for coating single-ply roofing membranes, the roofing contractor, consultant or specifier should request the AcryShield A502. Restoring your aged and failing EPDM roof allows you to save a substantial amount of money and time on avoiding a roof tear-off while gaining a seamless roofing system with high reflectivity. When initially installed, an EPDM roof is ballasted, mechanically attached or fully adhered to the roof. Shrinkage occurs to the EPDM as the oils of the substrate slowly evaporate, causing the EPDM to become brittle, losing its flexibility and capability to expand and contract with different temperature fluctuations. The shrinkage results in seam failure as the membrane tears away from the adhered substrate, eventually leading to roof failures. We have an excellent solution for restoring your EPDM roof into a brand new roof without business disruptions or closures. The AcryShield EPDM roof coating systems are ideal for proving excellent waterproofing, superior durability and protection, and reduced maintenance costs while extending the life span of the roof. Our AcryShield A502 base coat can be adhered DIRECTLY to the EPDM without the need for additional primers or etching rinses. (For more, download our FREE guide on Restoring EPDM Roofs.) This coating saves installation cost and time as the labor intensive and time consuming priming stage is removed from the process altogether. The AcryShield EPDM roof coatings deliver the benefit of a seamless roofing system. Seamless membranes provide waterproofing advantages because they are spray applied across your entire roof surface, including difficult areas such as HVAC equipment, pipes, drains and other hard to reach areas. The seamless membrane eliminates joints and patches, creating a very durable, monolithic surface with excellent strength and flexibility. For more information on fully restoring your EPDM roof into a bright white, highly reflective, seamless roof without worrying about a costly tear-off or any disruptions to your work environment during installation, click here to download our FREE guide Restoring Your EPDM Roof!